Origin: Rajasthan, India. Probably Bundi. Materials: Wootz steel, gold. Scabbard: Wood, silk velvet, silver. 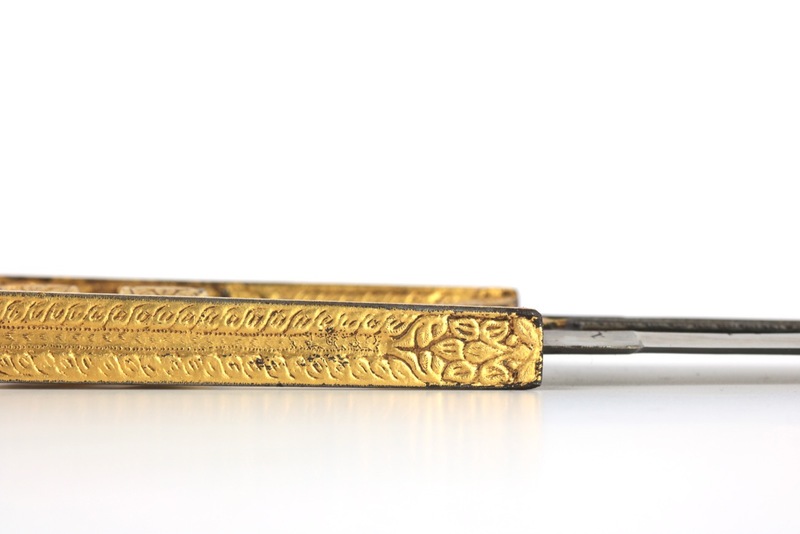 A north-Indian katar of a style strongly associated with Bundi. It has a substantial blade with sunken panel, with in the middle a "tree of life" motif. The sunken panel shows dark, fairly high-contrast wootz steel while the edges retain their original burnished finish. It's sits atop a base resembling an open book. The handle consists of two swollen handle bars, with two stylized floral elements in-between the bars. 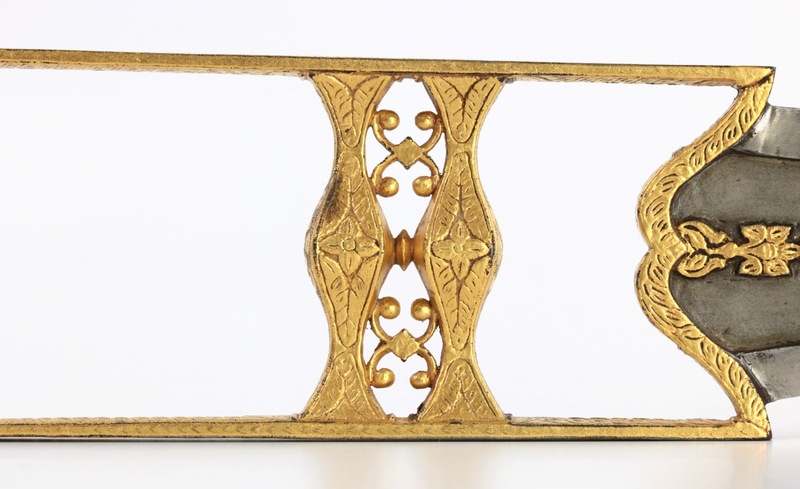 The entire handle is engraved with floral and geometric elements and is lavishly damascened with thick gold, most of it remains intact. There is what seems to be a tiny inscription on one side of the side-bars. I haven't been able to translate it, or even figure out what sort of script it is. 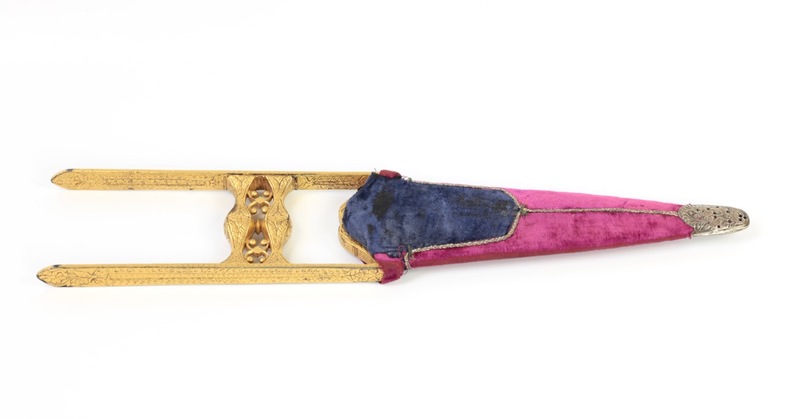 It comes with an old scabbard, covered in reddish-purple and blue velvet with silver lining. It also has a silver finial with floral decoration. Length 15 1/5 inches. " 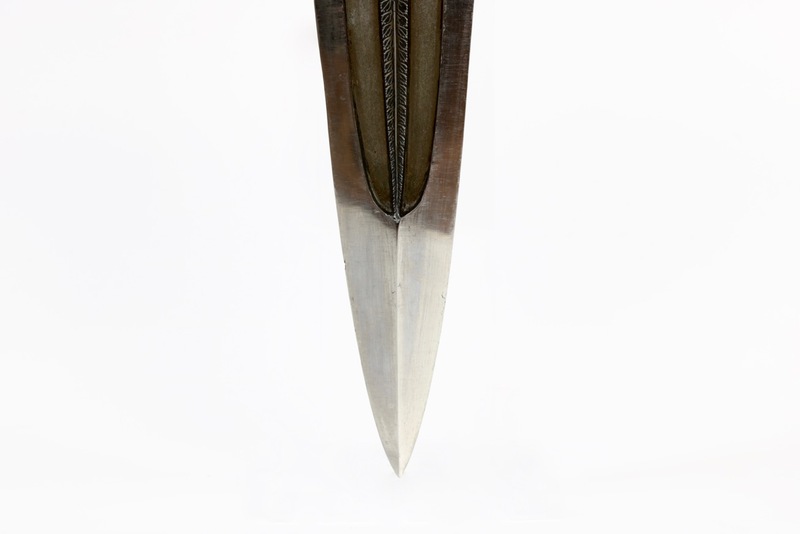 Close-up of Hendley's "Boondi katar". 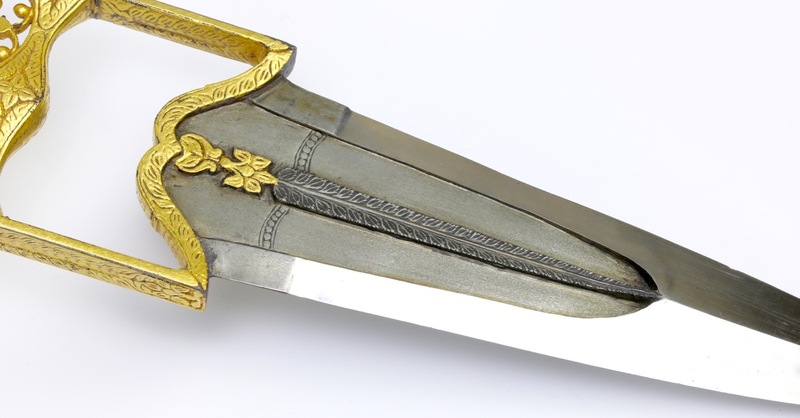 Close-up of our katar from the Leo Figiel collection. 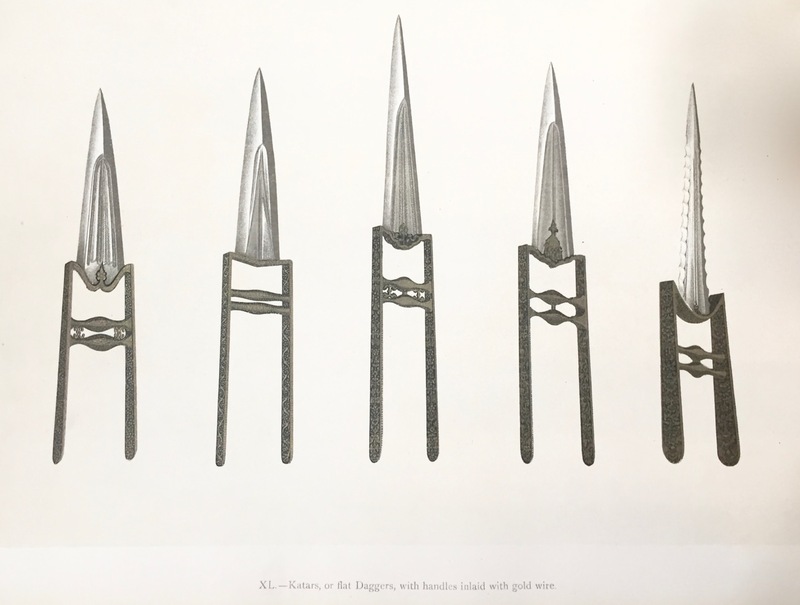 Katar number 3 is remarkably similar to the katar we present here. It was supposedly made by Thakursidas, an Ulwar servant. It is interesting to notice the prices of these pieces. 50, 40, 200, 50, 200 Rs. respectively. Ispahan steel is mentioned for katar number 5 and 9. Ispahan is a city in modern-day Iran, previously Persia. Persian wootz was renowned around the world, and used as blade steel for many Indian and Ottoman weapons. 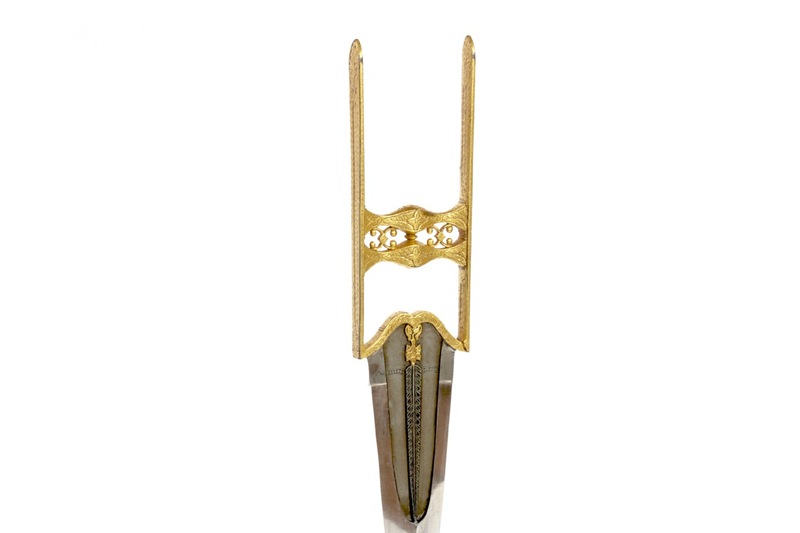 It is interesting to see that the Bundi katar of typical form is among the most expensive katars listed by Hendley. 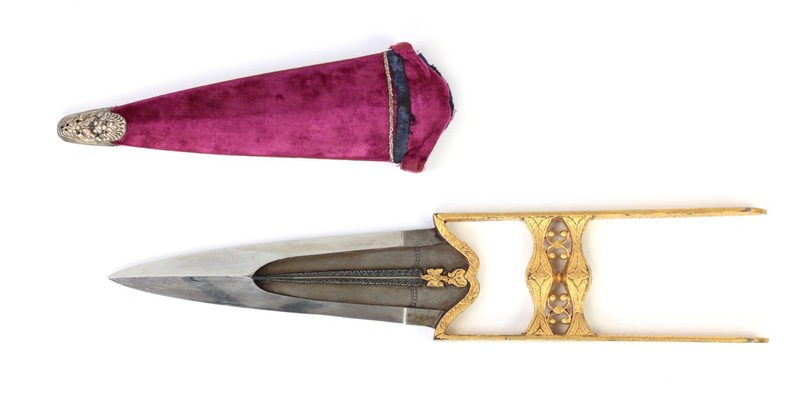 Considering the price, I wonder whether the Bundi katar mentioned here is perhaps also made of Ispahan or otherwise special steel, because as the steel cost even more than that of katar number 5. Also notice the lavish use of gold, 100 Rs. worth of it which is half the price of the piece. This seems to reflect the incredibly thick layer of gold we find on our example. Not often do we encounter items with sound provenance. This katar does. It comes from the famous Leo S. Figiel collection. 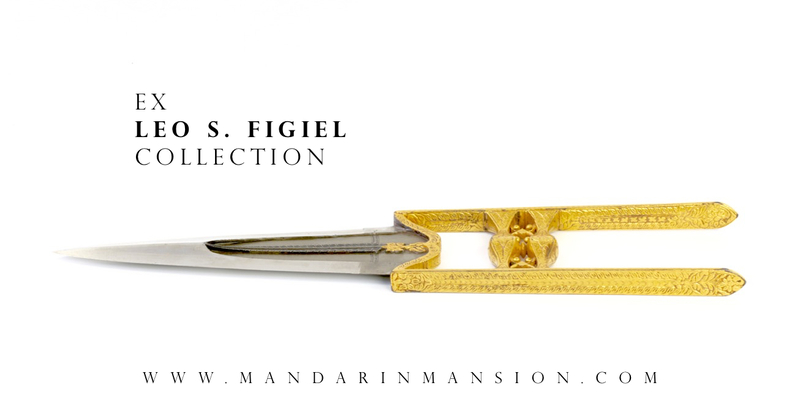 Mr. Figiel was a collector and of Indian art and Indian and Islamic arms and armor, who acquired many of his pieces during his trips to India in the mid 20th century. He sold his arms collection in August 1998 through Butterfield & Butterfield Auction House, San Francisco. 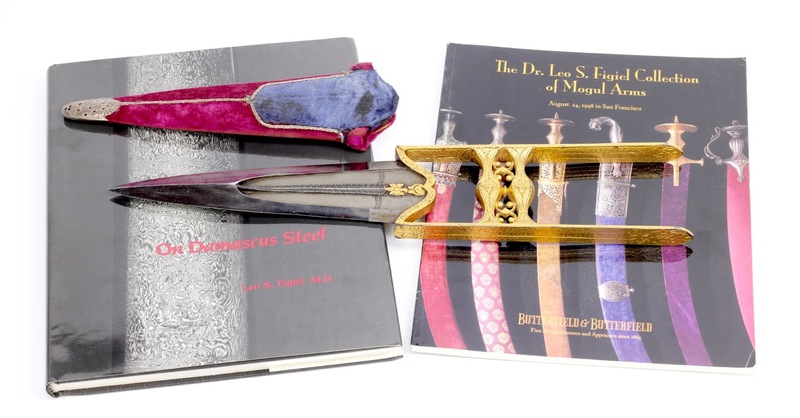 Leo figiel is mostly known for his book "On Damascus Steel", but because of the extent and importance of his collection, even the Butterfield & Butterfield auction catalog in itself is now highly sought after by collectors of antique arms and armor. The 8 1/4 inch Damascus blade with armor piercing tip. The Damscus pattern fuller with median ridge chiseled in the form of a Tree Of Life extending from a gilt lotus bud and blossom. 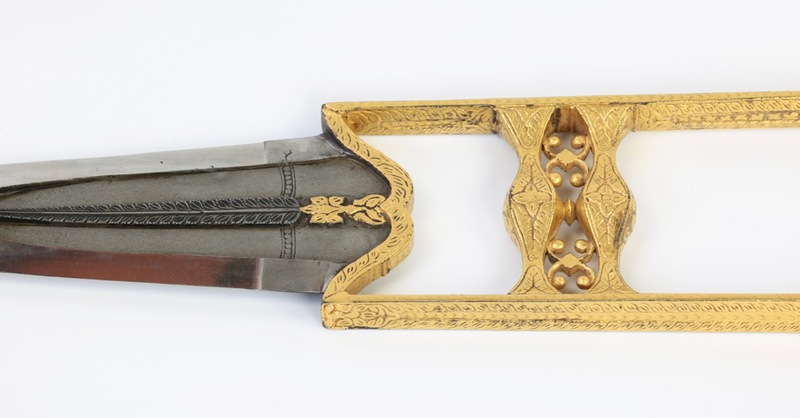 Hilt chiseled with floral panels and leafy borders and covered with heavy gold koftgari overlay with later red velvet covered scabbard. Condition: Blade showing few light scratches and one tiny nick to edge. Hilt with minor losses to gilt finish. Note: The kundalini flame is here represented as the Tree of Life. The scabbard is of a form typical for scabbards found on this type of katar, and exhibits the wear and tear I would expect from an old piece. 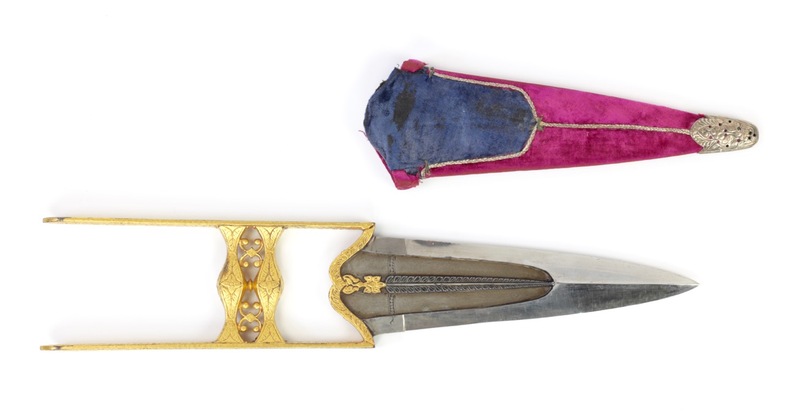 They probably classified it as "later" because it's color: These colors were only made possible by aniline dyes invented in Britain in 1860, so the scabbard is probably late 19th century where the piece most likely originates from the early 19th century. 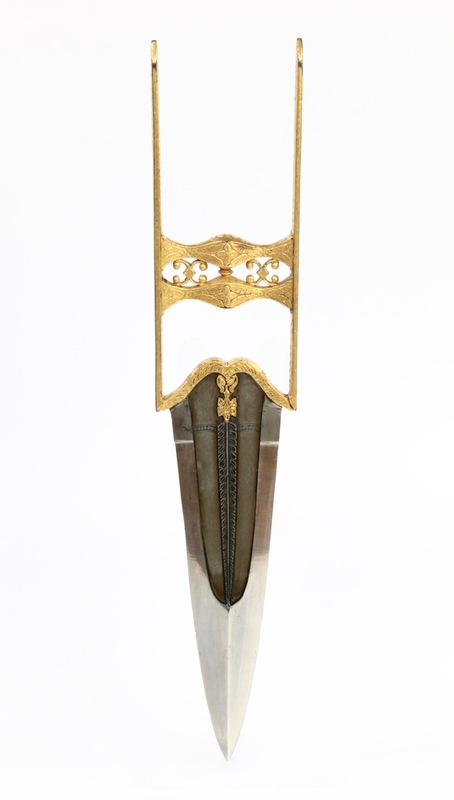 An impressive Bundi style katar, richly gilt, with substantial wootz blade. It has sound provenance, and comes from the collection of the famous collector and researcher, Dr. Leo S. Figiel. quantitative analysis, 1890-2000 . PhD thesis, Utrecht University 2007. Kindly pointed out to me by Peter Willems of helgot.com.